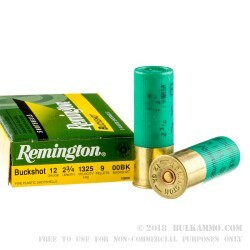 Effective against deer and home intruders alike, these Remington Express 12 gauge shotshells propel 9 pellets at a muzzle velocity of 1,325 feet per second for tight groups and maximum impact. 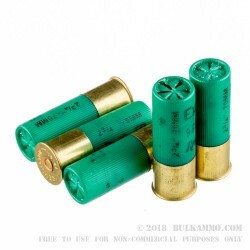 Cushioning and polymer buffer technology keeps the pellets in a round shape for improved patterns, enabling hunters to take shots at longer distances usually associated with rifles. 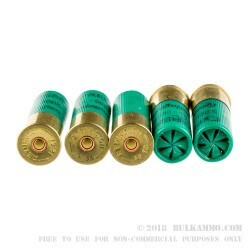 Each box contains 5 shotshells. Remington is a great American success story and one of the leading hunting arms manufacturers in the United States. In addition to a well-regarded line of hunting rifles, the company produces a category-leading selection of sporting and self-defense shotguns including the Model 870, Model 1100, and Model SP-10, among others. Founded in 1816 by Eliphalet Remington II, Remington has produced everything from flintlock muzzleloaders and bolt-action rifles to 1911 pistols and even typewriters. 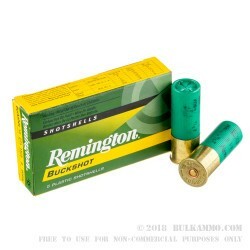 Uniquely among American gun companies, Remington also produces a wide range of ammunition products for self-defense, hunting, and range practice. The company's main headquarters are located in Rockingham County, North Carolina, while its production facilities are split between its original home in Ilion, New York, and newer plants in Hazen, Arkansas and Mayfield, Kentucky.